Below you will find a list of opportunities for adults of all ages. Joining a small group is an important part of church life and we encourage you to find one that's just right for you. Rick Morgan is leading the launch of a men's weekday fellowship group which meets on Tuesday mornings at 6:45 AM at the church. This group uses the traditional Methodist "class meeting" model of fellowship, accountability and Bible study. Rick hopes this group will be a means for all who participate, to grow in relationship with Christ together. If you are interested in joining this group, please email Rick Morgan at rickmorgan@ymail.com. There are many opportunities for older adults to get to know new friends, join together in caring for one another, study Scripture and consider some of the issues affecting our society. We have many small groups with a specific focus of service. Our Care Group creates small vase flower arrangements from our altar flowers to take when they visit shut-ins. Our Sewing Sisters make female hygiene kits for girls in Haiti. Epworth also provides transportation to and from Croasdaile Retirement Center and The Forest at Duke with our own church bus so our resident members can worship with us each Sunday. United Methodist women have been reaching out to “the least of these” here at home and around the world for more than 140 years. Women join UMW to grow spiritually, educationally and intellectually and to seek justice for women, children and youth. Did you know that United Methodist Women is the largest lay organization in any denomination? Our emphasis is on women, children and youth. You can find out so much more by going to www.unitedmethodistwomen.org. Eve Circle meets on the third Thursday of each month at 7:00 pm in the church parlor. Circle leader is Fran Whaley. Susanna Circle meets on the fourth Monday of each month at 12:30 pm at Epworth UMC and members bring their lunches with them. Circle contact is Emily Dike. Ruth Circle meets on the third Monday of each month at 1:30 pm at the church. Circle leader is Sue Stutz. All are invited to join Ruth Circle this coming Monday, March 18th at 1:30 PM in the Parlor for a very special “Happy Birthday, United Methodist Women” celebration led by Judy Bolt. Did you know that UMW is 150 years old this month? Come learn more and join in the celebration. All women and friends of Epworth United Methodist Women are welcome to come together four times annually for lunch followed by a speaker sharing about a mission outreach opportunity. All gatherings are in the Fellowship Hall immediately following the 11 AM worship service and childcare is available on request. Our next general meeting will be May 5th at 12:15. All are invited for lunch followed by our own Rev. Karen Whitaker as speaker. The United Methodist men are active in service to the church and community. They often prepare and serve food for church-wide events and support fund raising events for many ministries including Reality Ministries, the National Association for the Blind, local food banks, and many others. The UMM meet the second Wednesday night of each month for fellowship. All men of the church are always welcome. The Weeknight Fellowship Group was established in 2010. This small group is flexible and informal. They have meetings on a weeknight evening, once a week in the homes of members. The group is made of professional, working adults. Studies range from topics of interest to books of the Bible. Everyone is welcome! 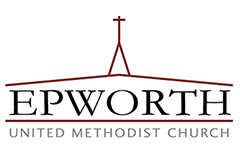 Please inquire with Sangwoo Kim at sangwoo@epworth-umc.org for more information and to be included on the group listserv. LENTEN STUDY: The Little Book of Biblical Justice! We’ll begin as a large group on March 10th with a lesson led by Rev. Dr. Wes Brown. From March 17th through April 14th, adult Sunday School classes are encouraged to meet as usual to continue the study. All are welcome to participate, even if you’re not a member of a Sunday School class, or if you missed the March 10th kick-off class. Copies of "The Little Book of Biblical Justice!" are available for free in the church office. Join Pastor Karen for the Lenten mid-Week Bible study “Simon Peter : Flawed But Faithful” by Adam Hamilton. We will meet Wednesdays noon to 1pm beginning March 13th. Feel free to bring your lunch with you. Please contact Pastor Karen or the church office to get a copy of the student book. Hinduism, Judaism, Buddhism, Christianity, Islam: These five great religions have influenced people’s lives for thousands of years. Starting this fall and continuing over five semesters, the Thursday class will examine each of these faiths, its history, geography, writings, beliefs, practices, and impact. The classes will follow The Great Courses curriculum, with weekly reading assignment, video and discussion questions. Spring Semester began in January 2019 with Reverend Dr. Sangwoo Kim leading the class. Please contact the office if you would like to participate at 919-489-6557. All are welcome and each semester is devoted to one of the five great religions so it is not necessary to have attended the previous session(s) in order to participate!